Just a friendly reminder that NJ’s first public pump track is having a Pump Jam this weekend. All kinds of crazy stuff going down up there and you BETTER attend. This will be the first of MANY pump track facilities in the tri-state area so this WILL be history in the making! Check out the Alexandria Pump Track page here and read about as well as witness what this place is all about….especially the video on the following page….I would swear that this place gets more people than EHT does on race day…you decide. Live the life, ride the BMX… and now, words from Bob and Jen Adase. 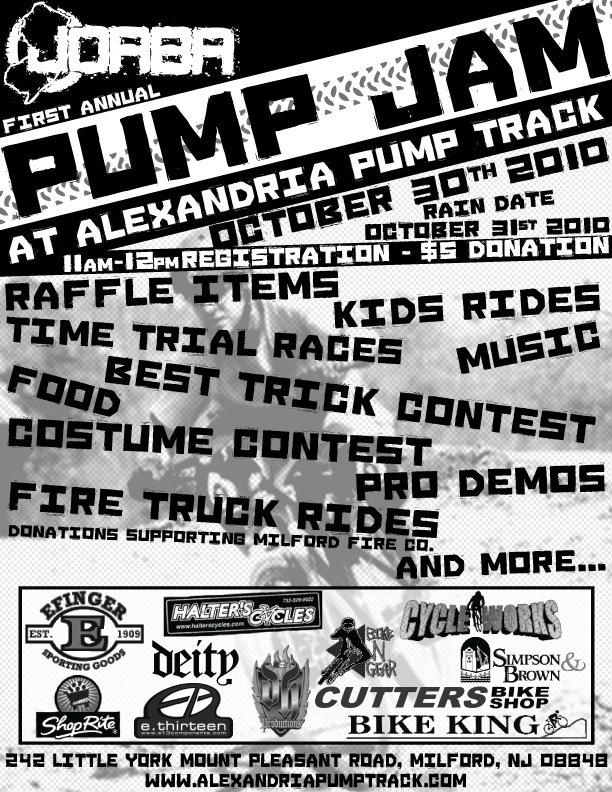 It’s with great excitement to announce our 1st Annual Pump Jam at Alexandria Park on 10/30. The track is in prime condition and we anticipate a day full of family fun and good times. Registration for the time trail races and jump contest begin at 11:00. Please note: there will be open track sessions throughout the day. So if you don’t wish to participate in the race or contest, you can still ride. Bring your bike, family, and dress in a costume. This event is going to be awesome! Attached is a list of all our sponsors and friends that have helped us make the Pump Track a reality. Without their help, the track or this event would not be possible. JORBA will be holding a Pump Jam on October 30th 2010 from 11am to 4pm to raise awareness and money for track improvements. Thus far, with the help of generous donations by Halter’s Cycles and local business as well as financial support by JORBA, we have spent over $6000 on infrastructure, soil and other items to make this a professional-grade pump track. But we need more money for on-going maintenance and purchasing more supplies (SoilTac). So we’ve decided to make some fun of it: a Pump Jam! costume contest and much more. music and food will also be available. In addition, Milford Fire Company will be on site to provide fire truck rides. Bring your bikes, helmets, family and friends and experience what everyone is talking about.